Industrial Conveying (Aust) Pty Ltd has increased its level of turnkey capability in design, manufacture and supply of materials handling equipment and systems. The company is doing so to meet a growing call for supply of equipment with a full electrical package and control technologies. This allows it to work even more closely to the objectives of the mining and quarrying industry, engineering companies, construction contractors, food processors, warehouse and logistics organisations, transport companies and ports and wharf operators. Using the most up to date electrical and control systems opens avenues for the company to perform more in-house commissioning and testing for greater user-specific development. This is delivering lower installation costs, reduced installation time and better outcomes for its customer base. Managing Director of Industrial Conveying Australia, Mr Don Erskine, says that one of the most significant changes in the industry has been that more and more customers expect turnkey projects. “It was imperative we meet industry demands for turnkey projects and with every job look to complete the task with even greater speed and accuracy,” said Mr Erskine. “Because we are an Australian company with our technical base here, we already have a head start on much of our competition because these are predominantly operating from North America or Europe. “While all our people are based in Australia and our technology manufactured and refined here, foreign competitors are likely to be bidding for projects on a satellite basis and have a technology supply line that is likely to be delayed by import channels. With the cost of electrical automation ever increasing, Industrial Conveying (Australia) is perpetually identifying and integrating new technologies to reduce the manufacture and installation time, whilst still providing a cost effective and reliable system to the end-customer. Modbus, devicenet and profibus communication networks to control the operation of motors, scanners and pneumatic valve banks located in the field. Modular and programmable safety relays, all devices are connected via a safety bus cable and the logic for the safety system is programmed via the control units. Smart Variable Speed Drives with integrated software to provide high speed, accurate positioning of conveyors, instead of using high cost servo drives. 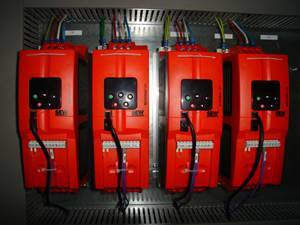 Modular busbar mounted motor control starters. Wireless communications to control equipment over long distances. “We know that to stay competitive in the industry it is vital to keep up with ever-changing technology and provide electrical teams with up-to-date technology and ongoing training to stay in front and meet industry expectations and returns,” said Mr Erskine. (Aust) Pty Ltd will be in touch as soon as possible.